Hi busy moms, dads & caregivers! 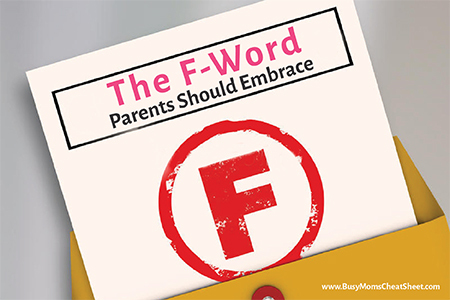 Today, I want to share with you such an important lesson in my book, “Busy Mom’s Cheat Sheet: Raising Happy Healthy Kids”, and the F-word all parents should embrace. Please teach your kids how to fail and fail well. Fear of failure is the primary reason for people not achieving their goals. This lesson was especially hard to teach my kids since if I had to teach my kids to feel the fear and do it anyways I had to do this myself. I had to lead by example. Take more risks, get outside of my comfort zone. I had to find my own courage. I still struggle with this which is why it was so important for me to teach this to my kids from a young age so that it is more second nature and not as much of a struggle for them. I remember passing up on the opportunity to study abroad in college for fear of risking my relationship with my boyfriend if I was away for a few months. I also remember the time not so long ago when I didn’t take a job because I was afraid I wouldn’t do a good job because there were some responsibilities I hadn’t done before. When I’ve acted from a place of fear, it always led to regrets. Great things have been happening outside my comfort zone. 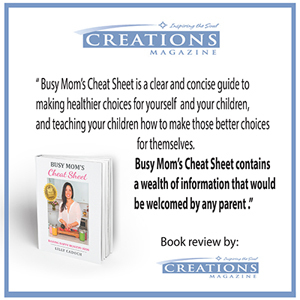 Publishing my award-winning book, Busy Mom’s Cheat Sheet: Raising Happy Healthy Kids is living proof of that. Sharing personal stories in my book, being ok with people reading/critiquing my work, sharing my own personal failures/success was no easy feat, but it is what makes my book authentic and relatable to so many busy moms and caregivers struggling to balance it all. And by the time I finished my book, I came across a job offer that was a promotion from my previous job. Applying to such a job in the past would have never been a consideration. But I did, I got the job and I’m juggling it with my passion to empower myself and other moms to raise happy healthy kids. Share your personal failure and success stories with your kids, it will bring you closer. Read autobiographies of successful people, especially the ones your kids admire, to show that success came with hard work, failure, and continued perseverance. And be there to help them up when they fail so that they can own it, determine the root cause, and learn from it on their own personal journey of success. These tips were inspired by my award-winning book, “Busy Mom’s Cheat Sheet: Raising Happy Healthy Kids”, available on Amazon today. 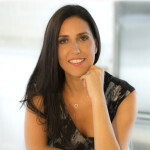 To raising happy healthy kids!